Google has reportedly resolved the issue where anyone can change the open date of a business listing in the local Google results and ultimately hurt that business from ranking in the Google local results. Jason Brown via Nate Somsen noticed Google fixed the issue and informed me of it on Twitter. As we reported earlier, Tim Colling noticed that one listing was no longer doing well in Google and noticed someone changed the listing to have a future open date. Jason explained that Google's fix here is "for open locations, user can only suggest the current day." He said he "can add tomorrow's date as an option." But "For future open dates, users may suggest month and/ year. 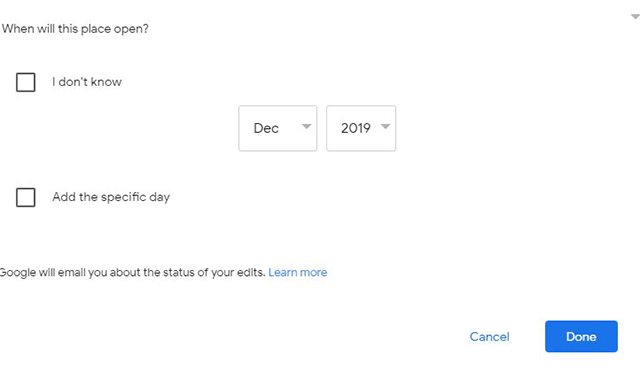 Last option to use as a suggestion is Jan 2020."